An Inverkeithing man, who threatened ambulance staff trying to help his girlfriend after a suspected overdose, has been given a custodial sentence. Paramedics had to deal with verbal abuse from Liam McGarvie as they tried to give assistance to the female. McGarvie (20), of Spencerfield Road, admitted that on 19th February at Fraser Avenue, Inverkeithing, he assaulted, obstructed or hindered a male and female paramedic by shouting, making threats of violence towards them, acting in an aggressive manner and attempting to enter the ambulance. 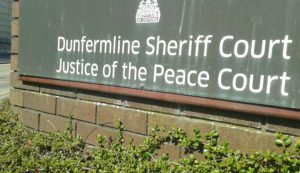 Depute fiscal Alisdair Shaw told Dunfermline Sheriff Court the ambulance was called out just after midnight after a report that a female had taken an overdose. The paramedics arrived to find McGarvie in an “irate” state. “He told them, ‘You better sort out my girlfriend or else’ and that ‘The police had better not be coming or I’ll be kicking off’. “The ambulance crew treated the female. The accused continued to be irate and she was taken into the ambulance. The court heard unemployed McGarvie was already on a community payback order. “Anxiety issues” had prevented from doing more than nine and half hours of his unpaid work, said defence solicitor Brian Black. Sheriff Charles MacNair told McGarvie, “This was an offence committed while you were on bail towards paramedics who were trying to treat your girlfriend. He sent McGarvie back to detention to complete the remaining 26 days of a previous sentence. He also imposed a consecutive term of 110 days for this latest offence.